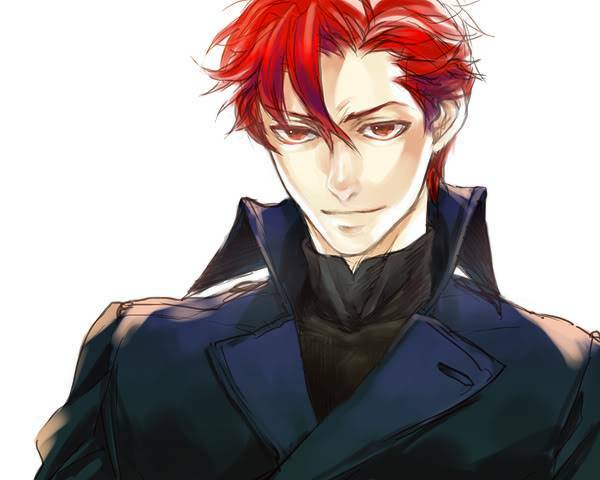 General Appearance: Adonai has wavy red hair with a single strand that is centered between the eyes. He has a stern face; though this is a bit misleading since he in general he likes to act more like a stooge. Adonai being a Paladin is one of the few people to still wear protective armor. He attempts to upkeep a noble stature and is well groomed. His main outfit off duty is a dark black frock coat made from leather and a black undershirt. Strengths: Paladins are much like Knights, except for one key difference - they have white magic. Though Adonai’s power in this tends to be low, it works well for certain tight situations. To sum up the training he has reached in the elite military unit of the Paladins, he has high defense, high life force, but overall his magic is lower, any combative magic is low; therefore, he must use a catalyst in order to make them more effective. * Thunder Slash - Lightning attack equal to 19% of his health. Current Goal/Purpose:To defend his little sister from anything or anything that might try to hurt her. As a Paladin, his unit is trained to defend the citizens from anything that can be viewed as an evil outsider. He is also in love with the Queen. Inabilities: Adonai likes to be in control. There are times when his desire to defend what he loves turns into a form of control and if people don't follow his way, he becomes angry and will strike whomever disagrees or will whine until he gets his way vs. what the other person desires. Fears: The death of his sister. General Personality: He plays the role of a caretaker and protector to his younger sister Chavvah, whom he gave the nickname Eve. Adonai believes in the goodness inherent in all beings, and in a code of conduct, be it a personal one or a set of laws, and that an ideal world comes from promoting this dualism of structure and benevolence. He is dedicated, in his own way, to the pursuit of law and justice. He always pleads with his enemies to stop attacking, but never hesitates to kill to save innocent people. However, this is not to say he is lawfully polite and often openly questions the logic of his teacher's doings. Adonai puts two people before anyone Adonai se in the world of time honored traditions and they are his 13 year old sister, Eve and Mistlyn. His closeness to the Princess make many of the other Paladins believe that he is putting her before their sacred god named Atticus, which puts him at odds with the Code of Conduct, which he is bound to follow at all times. At times he can be somewhat fool hardy, thus allowing for both Eve and Mistlyn to harass him about it. In response, Adonai is a pervert, often times pointing out the physical beauty of Mistlyn. Inner Personality: Idealist. Adonai believes the philosophies of his mentors, i.e. Law before Good. When Mistyln started to turn evil he had to face the dilemma of doing the good thing or doing the lawful thing. The teachings of Lord De Marisco corrupted her into attempting to kill his sister in order to protect her nation. However, killing an innocent is unlawful… So he went with the lawful option and fought against Mistlyn, even enough he loved her. Expect that he will obey the law, and he is an essentially good person who will never, ever side with the forces of evil. But when it comes to the crunch, the Paladins will remove an unlawful leader today and hope somebody else can clean up the aftermath. Secret: Every night has a dream of his sister's death. General History: At the age of 25, Adonai still does not have any plans for his future. His only ambition is to become a valiant paladin ridding the world of evil. Adonai's past is not that interesting and he tends to stress this. He enlisted at the young of 18 to be a Paladin. How he first met Mistlyn has never been revealed, though their relationship s has caused some controversies. Chavvah is his half sister, but he still feels that she is one of the most important things to him. He was the person that gave her the nickname of Eve, which most people know her as. Eve likes to claim that she's underclass so that people leave her alone and thus works at her mother's dress making shop. Adonai is not too pleased about her doing that but feels it's her own choice. Present Life: Dead. When Rane’s father died, she also lost the respect of Lord De Marisco. De Marisco viewed Rane as being too weak willed and that’s why her kingdom would surely fail. Adonai called him out his, but DeMarisco in response called him a mere fool. With Zeledin’s forces currently on the defensive, Adonai was ordered by his superiors to move the Queen to the countryside. There he introduced the queen and her handmaiden Lassi to his younger sister. Rane’s exile made her desperate to look for the Living Goddess. Rane realized that Eve had incredible strengths by accident and demanded that she work for her. Eve flat out refused and soon found herself being constantly pressed by Rane. One night, Rane found Eve alone and destroyed her body and placed her spirit inside of the void barrier. Without a mortal body blocking all of her inner power, Eve became a source of seemingly infinite power. With the main core ready, Mistlyn could finish her airship. She planned to use this weapon on Rellinia. This was almost prevented when Adonai halted Mistlyn inside the airship. The void barrier was on her very person. Enraged, Mistlyn attacked him with her best skills learned from Dedrick. Adonai fought against her with much fury. He came close to overthrowing her but couldn't see himself killing the woman he loved. Broken hearted and distressed, she curled into a ball accepting her death was near by. However, he threw his sword away and extended his hand to her. She was unsure if he was truly going to forgive her. Adonai then smiled at her. That was until he felt his own blade jabbed into his back. The last thing he remembered hearing was "I told you that you were a mere fool." His death sparked the Paladin Rebellion.